Don’t hate! 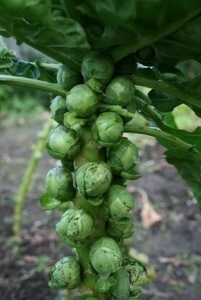 ‘Spruitjes’ are without a doubt the most misunderstood vegetable in this world. Their cabbagey deliciousness is completely under-appreciated, in my humble opinion. The problem with ‘spruitjes’ is that most people who label them the fruit of Satan, don’t buy them fresh. For purists like me, that’s strike #1. Worse yet, the misunderstood sweetlings are then dropped into a pot of salted water and boiled until there’s no sign of life left in them. Strike #2! Slice the little cabbages off the stalk as listed above. Take the cleaned & trimmed fresh sprouts, and slice each one in half or in quarters, depending on the size. You can also leave them whole, it’s up to you. Chop the fresh thyme finely. In a heavy pan, such as cast iron, cook the pancetta until beginning to brown. Remove and set aside. Melt butter in the remaining pan drippings and cook shallot until softened and translucent. Add sprouts and cook over medium heat for approx. 6-7 min, until they are bright green, beginning to brown and somewhat soft. You want your spruitjes to still have some ‘bite’! Add 2/3 of the chopped fresh thyme and pancetta back in the pan, stir and cook for an additional 1-2 minutes. Season with salt & pepper to your liking, and sprinkle fresh lemon juice & remaining fresh thyme over the top. Please don’t hate. Try these, they’re delicious! Congrats!!! 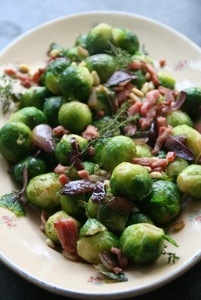 Your Brussels Sprouts With Pacnetta & Shallots has been featured on Nibbles By Nic Munching Mondays this week! !